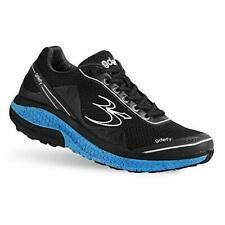 Gravity Defyer Gdefy ION Athletic Shoes Sneakers Mens 11. Condition is Pre-owned some scuffs and such as shown in pictures. Soles have tons of life left. No tears or rips. GDEFY Gravity Defyer TB902MWG Men’s Athletic Pain Relief Shoes Sz 10.5. Condition is Pre-owned. Some normal wear and age see pictures very nice condition overall Shipped with USPS Priority Mail. Please view the pictures and description for reference. If you would like any additional pictures, information or have any questiones at all, please contact us. Size: 8.5M US Men's Heel Height: Shaft Height: Shaft Circumference: All of our products come from a smoke free environment! Please keep in mind that there may be a slight color difference between the product and the pictures due to different monitor calibrations. G DEFY BALLISTIC RED/BLACK. Look at your feet! The toe box is wide, allowing your toes to stretch out. Its external heel cage (made of specially formulated polyurethane) adds lateral support, while the upper has been made of special breathable synthetic fabric. Roomy Toe Box. Color: Gray. Front Rocker Sole. Removable Insolesa. VERY NICE SHAPE, LIGHT WEAR, SEE PICS. GRAVITY DEFYER G DEFY Men's Black/Yellow Athletic Fitness Walking Sneaker Shoe Three Sping System Size 10. Shoes are in outstanding condition, showing only light signs of use. They are extremely clean, only worn a handful of times. Soles are also in outstanding condition, hardly any wear. I listed several detailed pics, judge for yourself. Original box is not being offered. Buyer will recieve exact item shown in pics. Feel free to ask questions and thanks for viewing. Excellent conditions, very lightly used, clean outside and inside. G-DEFY Gravity Defyer Comfort Fit 3-Strap Black Leather Shoes. G-Defy Gravity Defyer Mens Athletic Walk Comfort Shoes Sz 11 M . Silver with purple accent. Triple spring air cushion system. Condition is Pre-owned. Very nice condition, slight blemish near toe ( see last picture) Shipped with USPS Priority Mail. The exterior black leather is in great shape with only very light wear. The inner soles area also in great condition with light wear showing. The bottom soles are in excellent condition with only very light wear. "This footwear features advanced technology absorbs shock to relieve pain and propel you forward to reduce fatigue throughout the body.". PRODUCT CLARITY: The color of the product may be different to the naked eye, then what shows in the pictures. In rare cases, with rare shoes, this may not be the case. · All Used shoes are sprayed with disinfectant to ensure freshness. · All shoes are authentic. I do not deal with anything else. 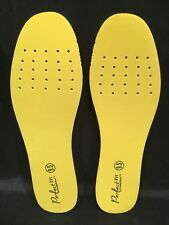 Insole widest width (at ball of foot) ~ 3 5/8". SIZE US 9.5 MAN SHOES SNEAKERS BROWN COLOR GDEFY GRAVITY DEFYER EUC. 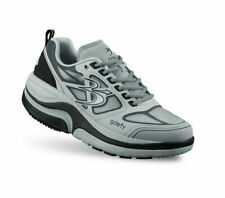 Enjoy Relief From Standing On Hard Surfaces With A Shoe That Makes Every Step Pillow-Soft. * Gently used a few times only as shown- no box or tags *Outside length heel to toe is 12 inch *Width is 4 1/2 inch *Heel height is 2 inch *Inside length heel to toe is 11 inch *Size marked is man US 9.5. Runs true to size. *Removable pads Weare a member of E-bay since 2002. Check out our feed backs and bid or buy withconfidence. These "Reverse Trampoline" Spring sole shoes with VersoShock are NIB. Amazing quality. Perfect for any season. I ordered these shoes and wore them for less than 2 hours. They are the normal width. But the best feature of the Super Walk is the VS2 VersoShock Reverse Trampoline sole. 3x the shock absorption. Durable reinforced toe and heel guards reduces scuffing and wear. Burst on the scene with the Super Walk. Man you must see the bottom of these shoe they eat the earth awe duuuuuuuude see pics who else makes shoes like G-Defy. Shoes are in great pre-owned condition. Very light wear at all. In rare cases, with rare shoes, this may not be the case. I will do my best to accommodate them all. · I’ll do right by you. Gravity Defyer Sneakers. Pre-owned in Excellent Condition. Comfort Fit Insoles. Special features: Pain Relief, Orthopedic. Can remove insoles for orthotics. Type: Athletic. Condition: Pre-Owned, but Barely. Gravity Defyer GDEFY Black Orthopedic Walking Shoes Mens 11.5 Gently Used. Condition is Pre-owned. Shipped with USPS Retail Ground. 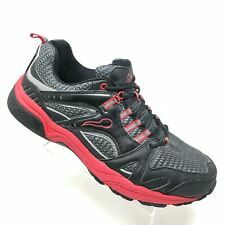 Gravity Defyer Men's Athletic Shoes Men's Sneakers /walking shoes Pain relieving VesoShock III Soles Size 9.5 Color: Gray TB9016MRW-M Condition: Very good condition. These shoe show some wear as expected with use, remnant dust in nooks and crannies and on bottom of sole, marks near toes and wear on interior label. Laces, Sole and materials are all in good condition. Please see pictures showing item details and condition.... .
All leather footwear has been recoated professionally to ensure it best quality. Any major flaws that cannot be fix or repair will be show in pictures with details. See photo for more relevance detail.